3D renderings. Where do I even begin about the importance of 3D renderings? Let’s start with ‘what’s a rendering’? RENDERING: A rendering is merely an image-quality digital picture. It is typically built in a 3D software to show you what your space will look like. 99% of people* cannot visualize what a space is truly going to look like based on the small material samples they are shown, and while trust in your designer is appreciated, it’s equally important for you to feel confident in your (pricey) decisions based on truly knowing what it’s going to look like. Take a look at this blog post about a playroom we designed. Included are the renderings we showed the client compared to how the space came together. It even includes some elevations and construction drawings. 3D renderings are also hugely helpful with showing you different options for the same space so you can compare them side-by-side and choose your favorite! Here’s three different options for the same kitchen! 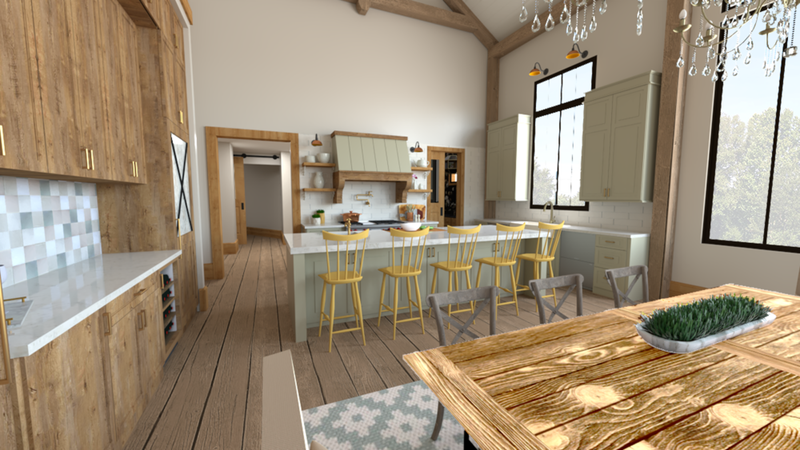 We originally introduced 3D renderings into our services in 2015 when we hired Nicole, and since we’ve been able to develop a more well-rounded client experience. They often describe the Fuchsia Design Experience as ‘fun’ and ‘effortless’, and when it comes to the end result – there’s no surprises which is the best part!